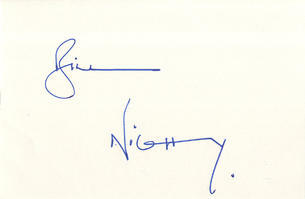 This is a hand signed 6" x 4" white card by the popular British comedy actor. William Francis "Bill" Nighy born 12 December 1949) is an English actor and comedian. He worked in theatre and television before his first cinema role in 1981, and made his name in television with The Men's Room in 1991, in which he played the womanizer Prof. Mark Carleton, whose extra-marital affairs kept him "vital". He became known around the world in 2003 for his critically acclaimed performance in Love Actually. Other notable roles in cinema include his portrayal of Davy Jones in Pirates of the Caribbean: Dead Man's Chest and Pirates of the Caribbean: At World's End, as well as Viktor in the Underworld film series. He is also known for his roles in the films Lawless Heart, I Capture the Castle, Shaun of the Dead, The Hitchhiker's Guide to the Galaxy, Hot Fuzz, Valkyrie, Harry Potter and the Deathly Hallows Part 1, and Rango. His performances were also acclaimed in the State of Play series and in the TV movies The Girl in the Cafe, Gideon's Daughter and Page Eight, for which he earned Golden Globe nominations, winning one for Gideon's Daughter.